From ornate columns to floor-to-ceiling bookshelves, the Royal Institution was an impressive choice of venue for an impressive event. 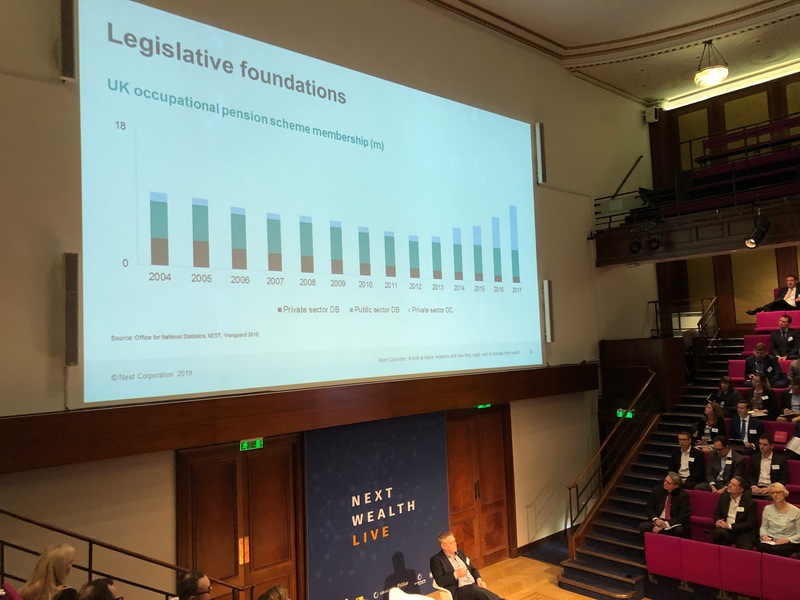 NextWealth Live promised excellent speakers and relevant topics – and it certainly delivered. The day was split into three: NextCustomers, NextAdvice and NextFunds, with each section hosting a range of speakers, formats and topics. 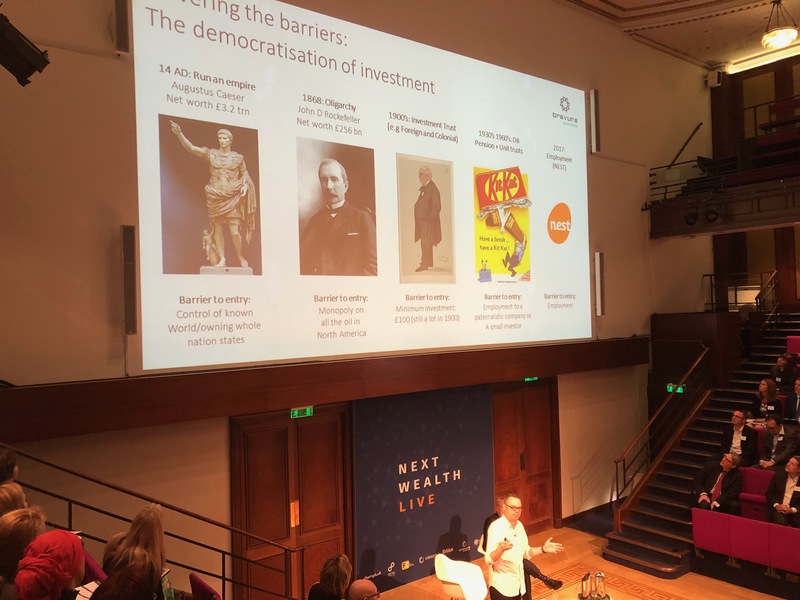 Inspired by Michael Faraday – he discovered electro-magnetism at the Royal Institution – NextWealth Live pushed the boundaries. Each talk looked to the future, challenging the audience to do better, think bigger and take a leap. Co-founder Heather Hopkins started the day with a motivational talk and a thought-provoking question: what’s obvious in hindsight is hard to see at the time – why? This theme ran through many of the day’s sessions and debates. And it serves as a reminder to always think bigger and critically analyse decisions. Whether it’s avoiding knowledge bias or taking advantage of new technology, Heather’s message was strong: what differentiates us as humans is our ability to dream. So, she encouraged the room to think about what’s possible – and how to make it work in their organisations. The CEO debate: what does a successful model look like? For the day’s first big debate, four CEOs took to the stage to describe what the ideal model or platform looks like for the market. Jackie Boylan, Fidelity; Mark Duckworth, Openwork; Ian Taylor, Transact; and Mark Till, Aegon made up the panel, which was chaired by Peter Mann. Combining these points with an ability to adapt and innovate should stand firms in good stead to succeed in today’s market. As will knowing your customer: remembering who you’re doing this for and who will benefit from its. Peter concluded the debate with a reminder to those running platforms: think more about the end customer and what they need. What’s the Power of Inertia for the NextCustomer? Otto Thoresen, Chairman of NEST, spoke in detail about who the NextCustomers are: where they’re coming from, what they want, who they trust and what the industry should expect. Their origin stems from the changing landscape of how people save: there’s a significant shift between people saving into DB schemes and DC schemes in the last 13 years. This is mainly due to auto-enrolment, a model built on behavioural finance theory: if you don’t notice money coming out of your pay packet, you’ll let it build up. But Otto questioned whether this will ever amount to anything worthwhile. As auto-enrolment stems from inertia, interaction and engagement with pensions is very low. More needs to be done to raise awareness of what’s going on. And there lies the risk: if people know how much is leaving their accounts, what will they do? Will they opt out? Or will they up their contributions? Ways of engaging people need to be tried and tested to fine tune this successful policy, and better help them save for retirement. Otto presented another opportunity for the industry: using digital services more effectively. These new customers may not be well-versed in interacting with financial services organisations. But they’re very experienced in interacting with other service providers digitally. 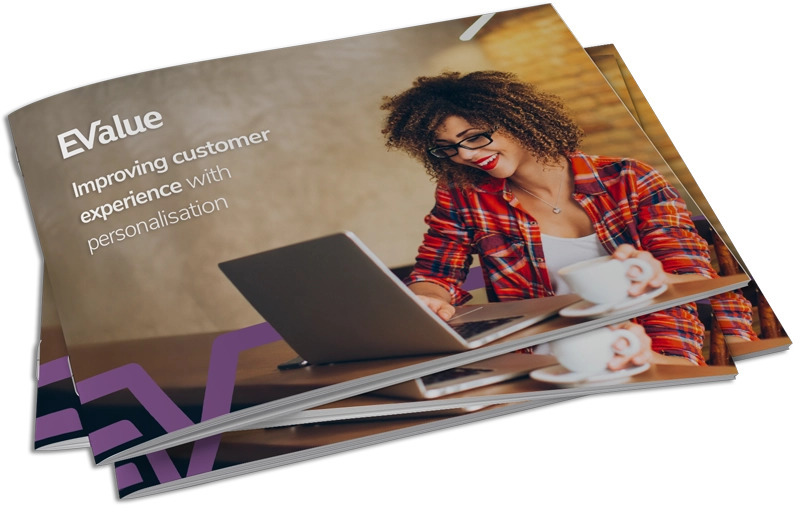 So, if financial service providers can create a digital experience for their new customers, they can make the process more engaging and keep it within a customer’s comfort zone. Simon Clare from Bravura then looked at how customers will use technology in the future. He took us on a whistle-stop tour of how technology was used to democratise investing. 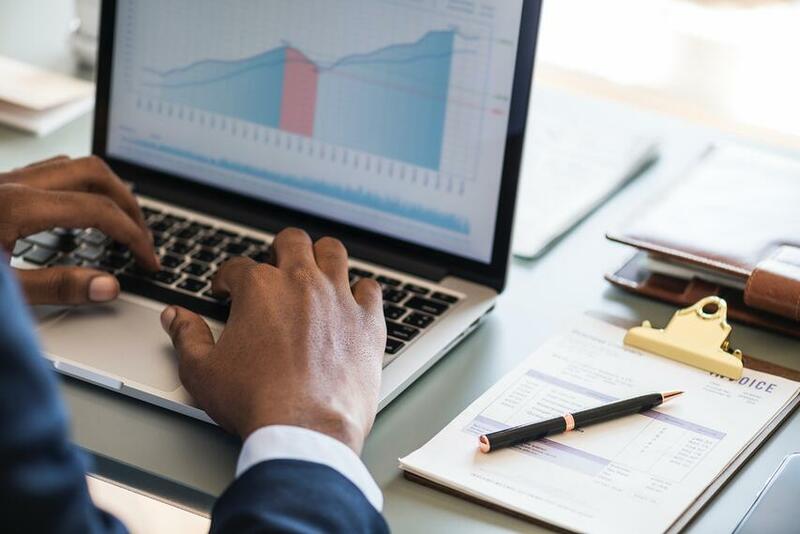 Technology has had a huge impact on financial services: from mass storage and processing to digital distribution and hyper-connectivity. But as Simon looked for the expected economies of scale and efficiencies through greater automation – he couldn’t find it. This posed a bigger question: how can technology bring costs down for the end-customers? But, as per Amara’s Law – given any technology, we tend to overestimate its short-term impact and underestimate the long-term impact – organisations will need to innovate, experiment and test to see how technology can truly impact customers. Moving on from the customer of the future, the next session focused on advisers of the future. The next generation will work in businesses that look very different to now: will they all be vertically integrated? What technology will they use? How big a part will robo play? Phil Young, MD of Zero Support LLP and David A Norman, CEO of TCF Investment debated vertical integration. David took the house view: This house believes that vertically integrated advice models are for the benefit of the firm rather than the client, while Phil defended the opposition. This lively debate showed how nuanced the discussion around vertical integration is. David’s energetic speech won the audience vote, so Phil was given a bright-green dinosaur tail to wear. 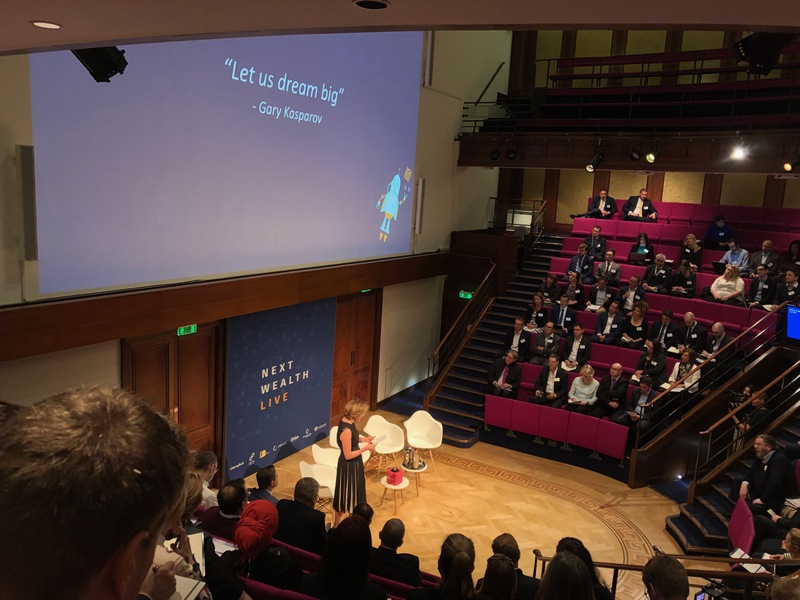 NextWealth Live didn’t just shake up the sponsorship model – with no sponsored speaking slots – but also the format of traditional events. A combination of presentations, debates, chats, case studies and panel discussions kept a quick pace. One of the more memorable sessions was Lee Robertson's soapbox. He talked about what adviser fees should look like in the future, using an imaginary venture as his example. Lee set out that a move towards cap-and-collar, flat or income-based fee structures could change the game for firms. A smaller pool of advisers: who’s going to give advice when they’re gone? A shift from focus on performance to cost when choosing solutions. A growing number of young people who put more trust in technology: they believe that the tech matters more than investment professionals. Some robo firms used this momentum as a launchpad. They pushed against human advisers to help advertise their services: “you don’t need that guy”. From this came a move into hybrid advice: people still need and want the empathy, trust and fine judgement that human advisers offer. Technology can’t offer this – and harking back to Heather’s talk, it’s imperative to think about what sets humans apart. For Nick, the sweet spot for robo success is a combination of technology, human advice and price point. And to help overcome challenges and do well in the market, firms may need to look at partnering with established technology companies. 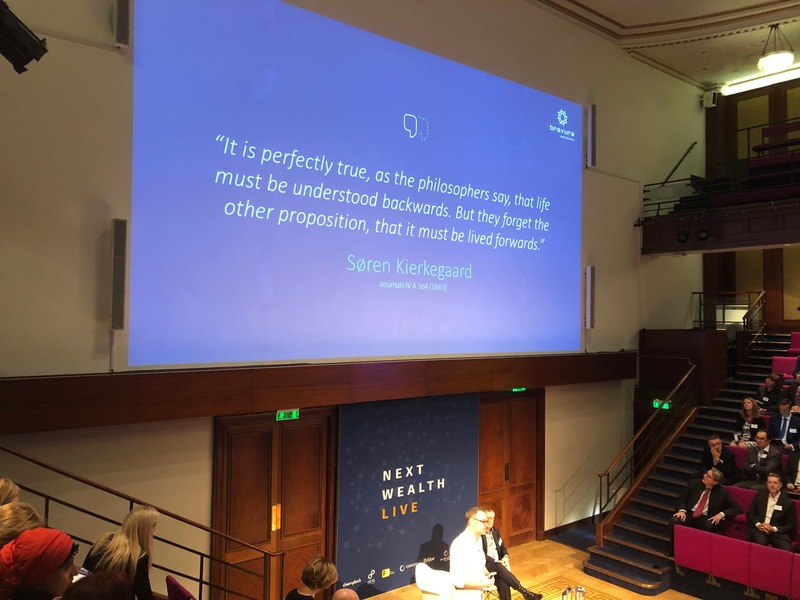 From scientists and philosophers to advisers and investors, the discussions and presentations at NextWealth Live covered every topic we could hope for – plus a few more. It was a brilliant day, and we can't wait for next year.